The American Roulette is popularly known as the younger sister of the French Roulette. The game is mainly played in the United States, but its roots can be traced back to the classic game of roulette albeit with a number of variations to give it the present form. The original Roulette was invented by Blaise Pascal, the world-renowned mathematician. It is believed that the first Roulette wheel originated from 17th century France when the Blanc brothers invented the single-zero wheel. The wheel made its way to the United States in the late 19th century where it underwent a number of changes including the addition of double zero. In the earlier versions of American Roulette wheel, the double zero adopted the form of an American eagle. This was how the famous American Roulette was born. It became very popular with the Western gamblers, especially during the California Gold Rush. What Makes American Roulette So Popular? There are many reasons for its popularity, but the beauty of the game lies in its simplicity and the myriad of betting choices it offers to the players. But it does not bet is standardized on al roulette tables. The tables in every casino can set its own limit on the smallest and the largest bet that a player can place. In between these limits, a player can place any bet that he/she wishes. In a game of American roulette, that table layout is actually divided into sections which are composed of individual number bets and group bets. The inside bets are those which are placed on individual numbers, a small group of numbers and even adjacent numbers. Betting on groups of 12 or more numbers is known as outside bets. 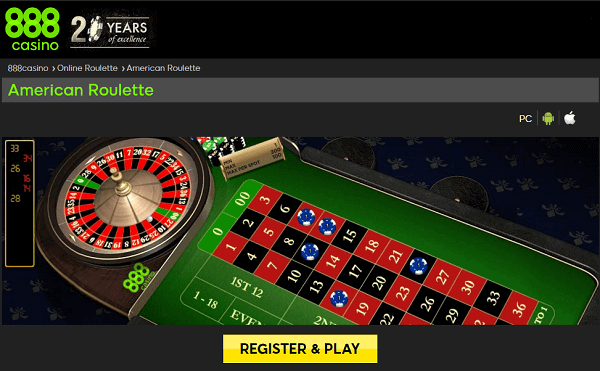 What Makes American Roulette Different from Europian Roulette? At present, the American Roulette wheel comprises of 38 sections. All the sections are numbered from 1 to 36, and there are two more sections which are numbered as ‘0’ & ‘00’. 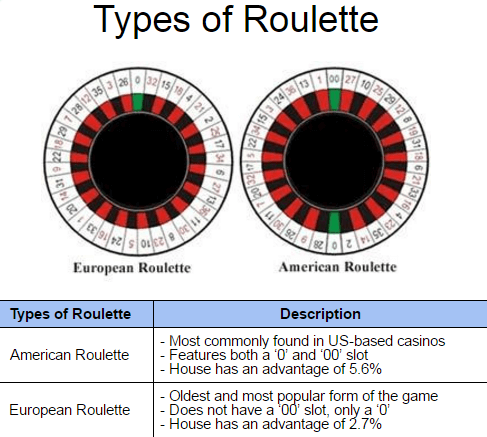 The two zero sections give the house a little more than 5% advantage compared to the much popular European Roulette which only gives about 2.70% as there is only one zero section. This is definitely the major difference between American and European Roulette versions although experts say there are a few more differences between the two. The color of the chips is yet another factor that sets apart the American and European Roulette. The players in European Roulette have to use chips that are of a uniform color which can make some games really confusing especially for the novices. On the other hand, in American Roulette the players can use chips of different colors which help them to distinguish the chips of one player from another. Another notable difference is that in European Roulette the European croupier uses a rake for gathering the chips while in American Roulette the dealer simply sweeps in the chips by using his hands only. Many people feel the winning an American Roulette involves a lot of luck. It is true that roulette is a game of probabilities but only believing in luck would never bring you great fortune. The result of the roulette spin cannot be predicted just by looking at the previous results. One cannot determine the result of the next spin given that the previous eights spins have all resulted in red. It can be yet another red or this time it can be black. People who believe in probabilities in roulette would answer that it would be black. But if you look at the whole situation carefully, the chance of getting another red is actually equal to the chance of getting another black. In a nutshell, the previous results cannot and do not determine the next result. So, you do need a bit of luck in these games. If you are very lucky, you will be able to register a win. When you pair your luck with a great roulette system, then your victory is more or less assured. When you are thinking of an American Roulette Wheel strategy, you need to understand that there are actually two systems in place –The Red/Black System and the Five Number System. In the red or black system, one just needs first to decide whether to place a bet on red or black. Actually, you start by choosing the color on which you want to place a bet and then place a minimum bet. If you win, then you can again choose a color and place the minimum bet. If you end up losing, then choose the same color but double the bet. This is to ensure that if you win, you will gain as much as what you would have won in the first attempt. So, if the minimum bet is USD 1 and loses the first bet then place a bet of USD 2 in the next attempt. If you win, you will be able to get USD 4. If you still do not win on the 2nd attempt, then again place a bet on the same color and double the bet amount. Keep doing this until you win because when you win, you will gain as much money as you would have won in the first try. The Five Number system is a bit riskier with a large payoff. In this system, you need to choose five numbers and then bet on it. This is basically a straight bet. If you win, you will get 35 times the amount that you bet. So, if you bet and win using one chip, you will end up winning 35 more chips. But this is not over yet. You need to be lucky one more time. You will need to choose five numbers again but this time you need to use 7 chips on each number till you consume all the 35 chips that you have won. If you win, you will get 35 times 7 which equals to 245. So, if each chip cost USD 1, you will gain USD 245. But before you start on this system you must be ready with USD 40 which is enough for eight tries using chips which only cost USD 1. Winning an American Roulette is not at all easy, and you do need to use a great and effective roulette system so that you can win roulette on a fairly regular basis.